Stem: prostrate to decumbent, < 1 m, strigose to glabrous. Leaf: stipules 5--7 mm; leaflets 6--10. Flower: pedicel > subtending leaf; sepals persistent, +- = to slightly > fruit body, appressed; petals 6--12 mm, orange. Fruit: 4--6 mm wide, ovoid; style to 3 × fruit body. Ecology: Uncommon. Sandy roadsides, slopes; Elevation: 1500--2000 m. Bioregional Distribution: c PR (near Warner Hot Springs, San Diego Co.), e DMoj, expected elsewhere; Distribution Outside California: to central United States, central Mexico. Flowering Time: Aug--Oct Note: Recently collected in San Bernardino Co., near site of 1950 collections. 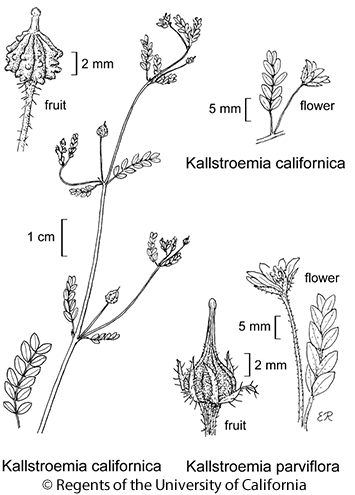 Citation for this treatment: Duncan M. Porter 2012, Kallstroemia parviflora, in Jepson Flora Project (eds.) Jepson eFlora, http://ucjeps.berkeley.edu/eflora/eflora_display.php?tid=29862, accessed on April 23, 2019.
c PR (near Warner Hot Springs, San Diego Co.), e DMoj, expected elsewhere; Markers link to CCH specimen records. Yellow markers indicate records that may provide evidence for eFlora range revision or may have georeferencing or identification issues. Purple markers indicate specimens collected from a garden, greenhouse, or other non-wild location.